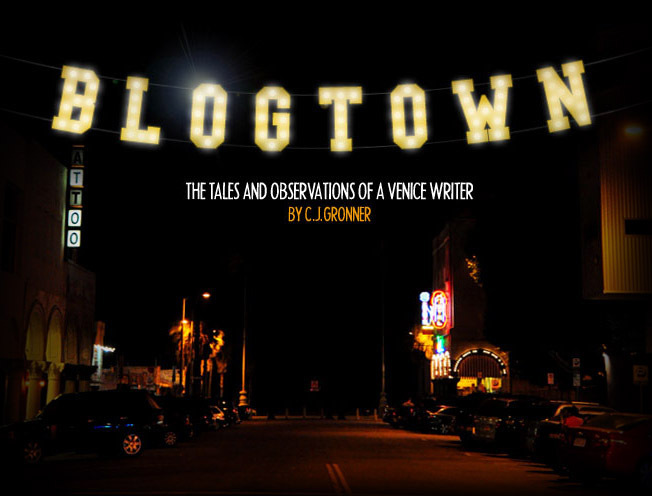 Blogtown: Abbot Kinney Street Festival 2012! 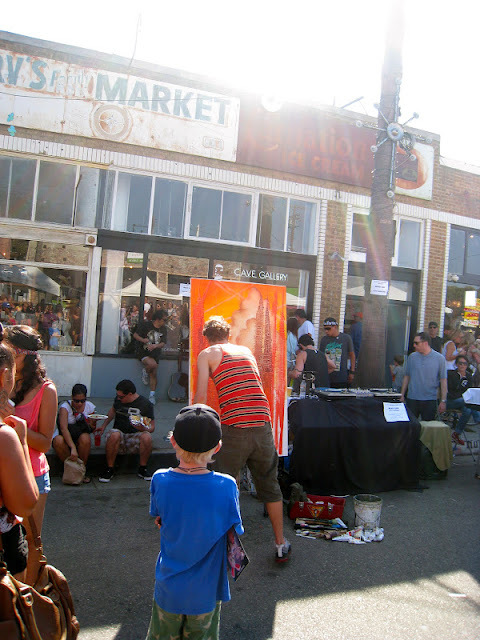 We always look so forward to the Abbot Kinney Festival every year, and this year could not have been a more perfect day for it. 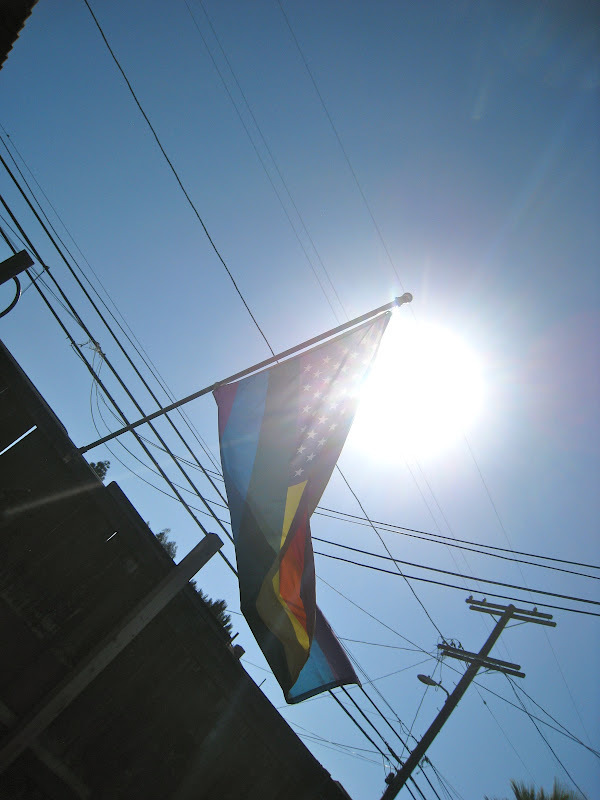 Gone was the oppressive heat at the beach that some maniacs have been complaining about (Never me), and a gentle breeze blew through the sunshine to create the most gorgeous possible day for all of Venice (and friends) to come together. Once again, the entire town seemed to be in a great mood, and once again it reminded me of a homecoming weekend, or Thanksgiving, when you see all the old, familiar faces that people get too caught up in their own lives to see every day. I actually (once again) didn't get to look at too many booths or things, as every two feet you would have another friendly encounter. I love that. 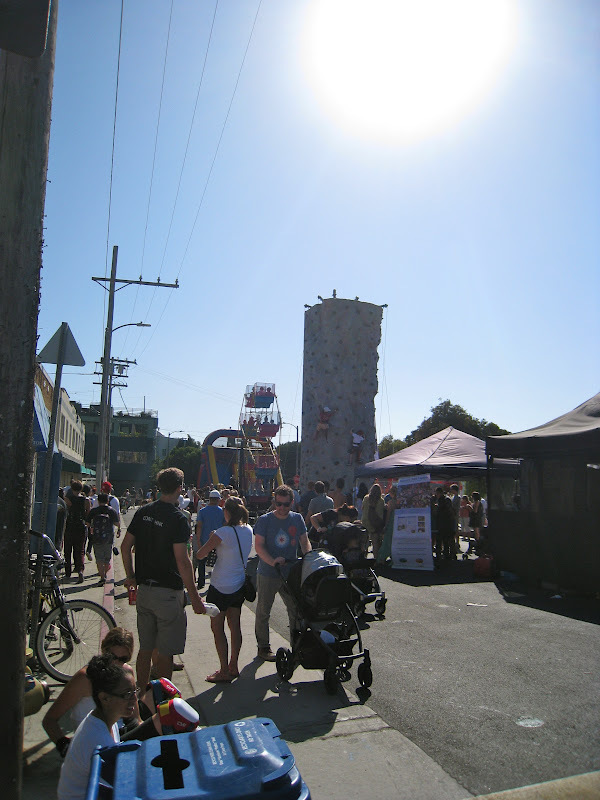 I spent a good chunk of the afternoon kicking it at the Free Venice Beachhead booth, where I got to meet many of our town's readers, hear their concerns, ideas, support and funny stories. One extra OG man told me how he'd lived in Venice all his life, and it "used to be FUN here ... now the Pigs won't let anyone have any fun. It's all Yuppies and money now". Though I did see a person with a real pig as a pet, I believe this guy was talking about the cops. They were pretty cool on this day, but they kind of need to be now, when many in our community are pretty down on them after the whole Ronald Weekley thing. One young lady asked "How can I donate to The Beachhead or become a Sustainer?" It made me so happy that someone in the teen demographic understands and appreciates the need and the work that goes into a FREE press. And that it's a very important method for preserving OUR Venice, the way that man remembered it. Preserving the FUN, instead of being all about the money and hipster b.s. I headed back out into the mix, encouraged. But this was a day for celebration, and everyone looked to be doing a great job at that. 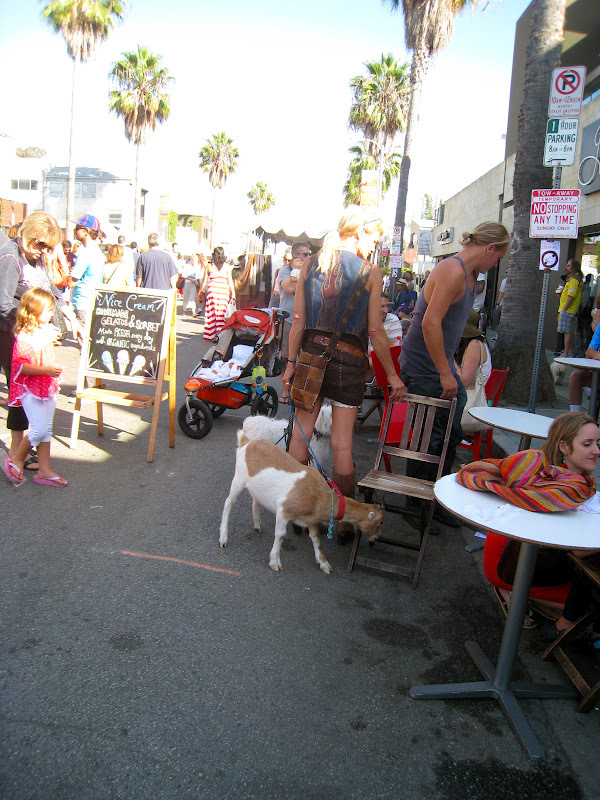 One great tip for ladies on Abbot Kinney Festival day is that the line for the ladies restroom is always the shortest at The Roosterfish. The 'Fish was completely packed all day. Gay, straight, every single genre of person having a total ball getting sauced in the daytime on the patio, where great looking hamburgers were being grilled up right in the middle of it all. So fun. The kids were having a whole bunch of fun at the kid area at Westminster School, where they could do a climbing wall, ride a little Ferris Wheel, and generally go nuts on all the sugar they were hopped up on. People out buying things too, from jewelry, clothes and art to hot sauce, fairy wings and feather headdresses. You could also register to vote to show your appreciation for the improved economy we were witnessing. You could eat anything you wanted, and there were so many delicious looking food booths that it made it difficult to decide (we went with Outdoor Grill and gourmet ice cream sandwiches - yum). It has irked me in recent years that the music stages did not represent our Venice musicians, hardly, if at all, which seems lame considering we all know GREAT musicians in Venice. Same deal this time around, and I really only made a point to catch The Living Things, who fired up the people hanging out at The Brig and the Palms stage. With all to see and do at the Abbot Kinney Festival, the very best thing remains the people. The people watching. Seeing old friends and making new ones. Seeing that some people walk goats around as pets, and some people don't really wear clothes. Some people wear really cool clothes. Some people get through the crowd on stilts. But everyone has a good time, and is happy to be here in our beloved Venice. Back home later, I could hear the clanging of the poles on the ground from the booths being dismantled, another successful year of the fair coming to an end. I heard a drunken crew rolling down my street and one of the girls shrieking, "This was the best Festival EVER!!!" She probably hadn't been to ones here in years past, but compared to others in the world, she was spot on. And the best part about the whole day every year is really that it's one big benefit for our desperately needed Venice Family Clinic. Good begets good. We love you, Venice! Thanks, as ever, for the FUN!
. . . just sayin.